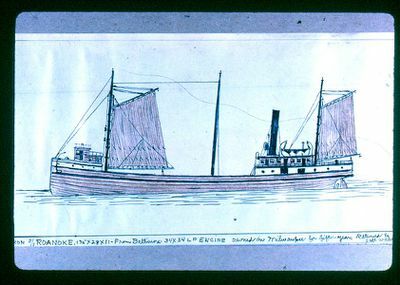 The iron steamer, Roanoke, 175 x 28 x 11, had a 34 x 34 LP engine; built 1871; Wilmington, Del. Owned on the Great Lakes for 15 years, and then went back to salt water. The vessel was chartered by Samuel Neff & Sons during the 1896 season on the Great Lakes. Listed in Inland Lloyds Vessel Register, 1893; listed Beers, History of the Great Lakes, Vol. 1, p. 881.